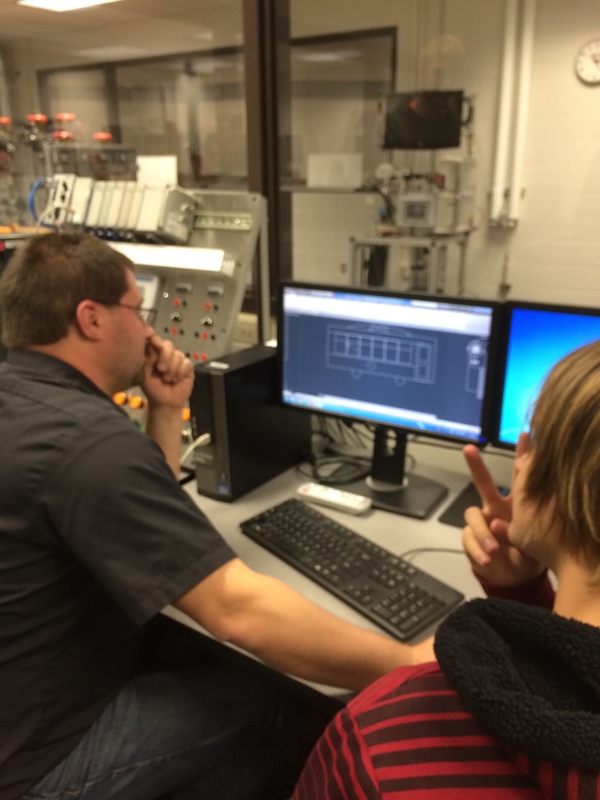 Posted on Nov 14, 2014 by Appleton Downtown Inc.
President - Light Up the Fox, Inc.
Students review CAD drawings for electric trolley display. I enjoy the nostalgia of walking down memory lane when I read the lists of sights, sounds, and inventions that kids today will never have seen, heard, or used. Now think of how a 15 year old would react to those same lists. Would they look confused, as they ponder in disbelief how anyone could have survived without the inventions of their day? These thoughts surface, recollecting the recent ’kick-off’ meeting with the students who will work over the next two months to create historical light displays for Light Up the Fox. I asked the kids from Appleton East and Appleton West high schools what they know about the history of the Fox River. Based on their top-of-mind response, I can only assume that there was a good review of the area’s hydroelectric heritage when the students were recruited for the project. As we probed deeper, somewhere hidden among the neuron connections of their brain were the stories of Native Indian tribes, early fur-traders, Marquette & Joliet, and post-industrial era river clean-ups. It was fun to create new connections by sharing stories of familiar names and places – such as: The Post Crescent selected the name ‘crescent’, because it meant a bend in the river. The diplomas for the first Lawrence University graduating class went down to the bottom of Lake Winnebago on the sunken steamboat, the Aquilla. This rudimentary review of historical facts planted the seed for the deeper lessons – how had it come to be as such, and what might it unveil about cause, effect, and the interplay of all the factors. Considering these lessons, it seems like history just morphed into science class – social science to be more precise. It’s an interesting bridge to build (play on river terms intended) since these students participate as a project learning experience for their technology education classes, with an opportunity to gain exposure to technology tools in the manufacturing wing of the Fox Valley Technical College, where they will meet weekly. As the introduction night continued, the students brainstormed ideas, drew diagrams, shared the leadership, and settled into unassigned roles based on skills and interest - Team-working skills not frequently practiced in the classrooms of my yesteryear, but incredibly important to preparing today’s students for workforce success in the future. Surprisingly, and pleasantly, the bridge to history reappeared later in the night. Appleton West students settled on their design for the light display – an electric streetcar. The contradicting elements of past and modern day melded when students pulled up an historic video, via youtube, showing the Last Run of the Electric Steer Cars in Appleton – April 6, 1930. They were crowded around the screen, struggling to recognize the route and compare old to new. Appleton was the first national location to have a successful streetcar powered with hydro-electricity. The company name, Trolley Street Car 86 Incorporated, commemorated the 1886 business start-up. It was only 4 years after the Vulcan Power plant began producing energy using the Edison centralized system. The video shows the path of the trolley car, across the Fox River on a rail overhanging the Olde Oneida street bridge, weaving between now antique cars, and turning at landmarks – some standing the test of time, others not, such as: the YMCA, Riverside Cemetery, First English Lutheran Church, Hearthstone House Museum, Morton Pharmacy (now closed), and Appleton Papers (renamed to Appvion). Audio accompanying the video, includes ragtime piano tunes and stories that set the stage of life in 1930. Among the stories: kids making snowmen on the tracks in anticipation of the collision, memories of the family being among the first to get a telephone, popular dances at Waverly, and descendants telling of the jobs their relatives held: superintendent of transportation, track foreman, and the starter who oversaw passenger boarding. The black and white choppy image of the camera positioned on the front end of the traveling electric streetcar elicited juxtaposed images in my mind. One image: Thomas Edison alongside his inventions: an enhanced lightbulb, as well as a phonograph (aka Victrola) and motion picture machine. The second image: my 22 year old son wearing his ‘go-pro’ camera during a recent whitewater rafting trip. Ah, the old and the new. Light Up the Fox is a non-profit 501c3 organization formed 3 years ago. Last year was their inaugural riverfront light display on Water Street (near Atlas Mill and Fratellos where the water treatment building once stood). The group will host an opening ceremony for the light display on Saturday, Dec 20. At 6 pm, after meeting at the Atlas Mill, people are invited to join a processional walk past the site, across Olde Oneida bridge where information and images of Native tribes and their river use will be posted. Then the group will return and gather at the light displays, where Wisconsin State Representative, Penny Bernard Shaber, will be the guest of honor to ‘flip the switch’ – illuminating the hard work and creativity of the students. Afterwards (7 – 8 pm) everyone is welcome to warm up at the Atlas Coffee Mill to enjoy Wind Eagle, from the Menominee Nation, as they share their culture through dance, music, and stories. This year’s light displays are sponsored by Appvion and Miron Construction. Van Ert electric has also donated services and materials. Light Up the Fox is accepting donations for an end-of-year fundraising campaign to purchase lights for next year at sale prices after the holidays. Visit www.lightuphtefox.org for details.